As much as mobile banking has been the hype in 2015, the banking industry is experiencing a bit of a hiccup when it comes to mobile banking satisfaction and CX. 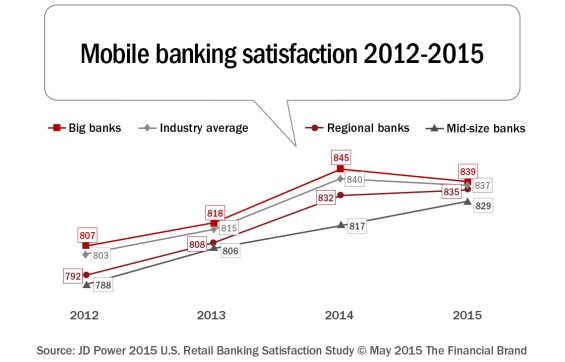 Since 2012, mobile banking satisfaction has steadily increased. Enter – 2015. Mobile satisfaction rates have dropped. What is the culprit of poor customer experience (CX) in mobile banking? While we’ve seen startups, such as Simple, Number26, or Moven, working towards alleviating these pains that mobile banking consumers are experiencing, traditional banks are still hard to work, building creative teams internally to create a simplified & frictionless customer experience (CX) for its digital and mobile banking applications. Abu Dhabi Islamic Bank (ADIB) just recently announced that they are building a ‘Digital Design Studio’ for just that reason – to improve the CX for its digital and mobile banking applications. The bank is partnering up with IBM to integrate their Mobile First for iOS Banking apps and Bluemix cloud technology in order to speed up development and launch of future updates and releases. “ADIB aims to be the best digital bank in the UAE and continuously invests in cutting edge technologies to enhance customer experience and introduce innovative new products and solutions to meet the evolving needs of its customers,” says Sagheer Mufti, COO, Abu Dhabi Islamic Bank. With the building of the Digital Design Studio in collaboration with IBM at ADIB as an upcoming case study for customer experience design in Fintech, will in-house design teams truly be able master the CX of mobile banking applications in order to increase satisfaction?